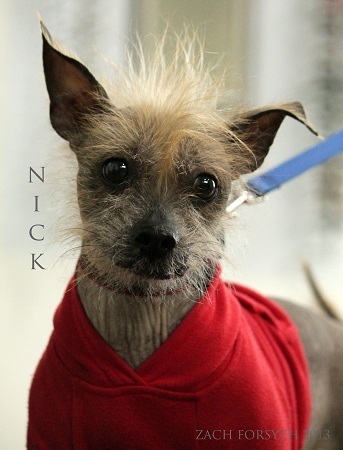 My name is Nick and I am a cool and quirky 9 year old Xoloitzcuintil, or Mexican Hairless if you prefer. What I lack in hair I more than make up for in personality! I am a playful goof with a lot of energy, and love strutting my stuff around the neighborhood making friends. When I’m at home I am an avid cuddler and I love nothing more than sharing the couch with a snuggle buddy, though I am a bit of a blanket hog at bedtime. I am a sweet and devoted friend to humans and animals alike (even cats!) and can’t wait to bring a smile to your face this Christmas. Feliz Navidad! Ready to add a pooch who needs a sweater collection to your family? Fill out an application at pixieproject.org so we can schedule a meet and greet! Being fixed, vaccinated and microchipped is all part of my adoption. My adoption fee is $220 and I am currently in foster care.